This recipe is part of my “3 Yogurt Bowl Recipes” video, the other recipes are my Mocha Banana Yogurt Bowl and Peanut Butter Blueberry Yogurt Bowl. The Mocha Banana post has more info and a video link with it. *Bee Pollen is known for improving the immune system and has many other benefits. If you have any pollen allergies or are pregnant, don’t use it because it can cause severe allergic reactions. To learn more about bee pollen check out this link. 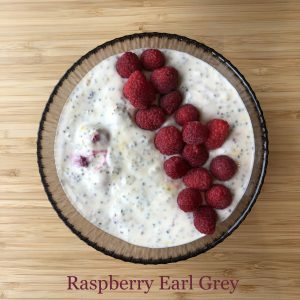 In a small bowl combine your yogurt, tea, chia, bee pollen, and half of your raspberries; mix with a spatula really well until everything is well-combined. Top off with the rest of your raspberries. Chill for at least 4 hours (to allow the chia seeds to soften) or store for up to 3 days covered in the fridge.